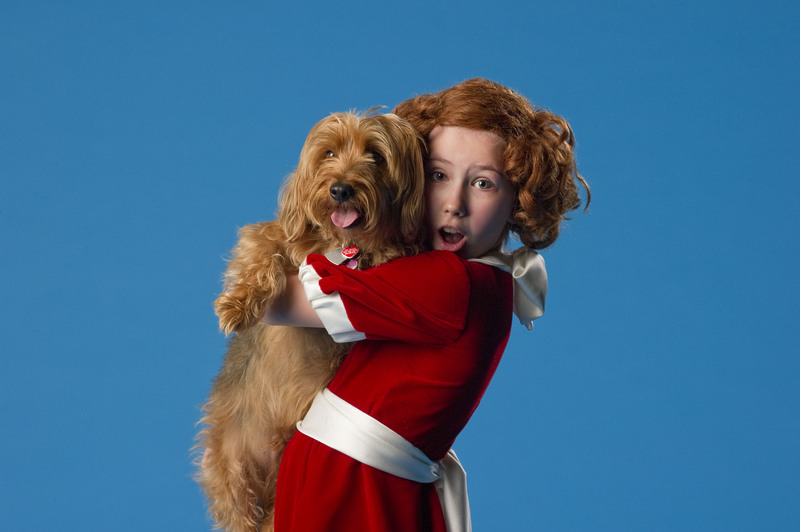 Dancing orphans, stray dogs and a singing billionaire return to the Metro Vancouver stage once again as Gateway Theatre presents the family favourite Annie as their 2010 Christmas musical. Michelle Creber in Gateway Theatre's Annie. Photo by David Cooper. Book by Thomas Meehan (The Producers), music by Charles Strouse (Bye Bye Birdie), and lyrics by Martin Charnin. Directed by Johnna Wright, musical direction by Allen Stiles, choreography by Kennith Overbey, set design by Drew Facey, and costume design by Carmen Alatorre. Starring Michelle Creber, Timothy E. Brummund, Nora McLellan, Matt Palmer, Barbara Tomasic and Pippa Mackie. Featuring Jessie Chan, Bridget Esler, Murielle Faifman, Maria Go, Kaila Kask, Aviva Knowles, Caroline Mawhinney, Fiona McIntyre, Laura Reynolds, Colette Richardson, Makena Zimmerman, Arne Larsen, Andrea Bailey, Matthew Beairsto, Vanessa Coley-Donohue, Andrew Cownden, Xavier de Salaberry, Jeff Deglow, Cameron Dunster, Brandyn Eddy, Madelyn Kriese, Stephanie Liatopolous, Brittany Scott, and Tamara Vishniakoff. Gateway Theatre presents Annie from December 9 – 31, 2010, at the Gateway Theatre, 6500 Gilbert Road, Richmond. Tickets are available online or by phone at 604-270-1812. 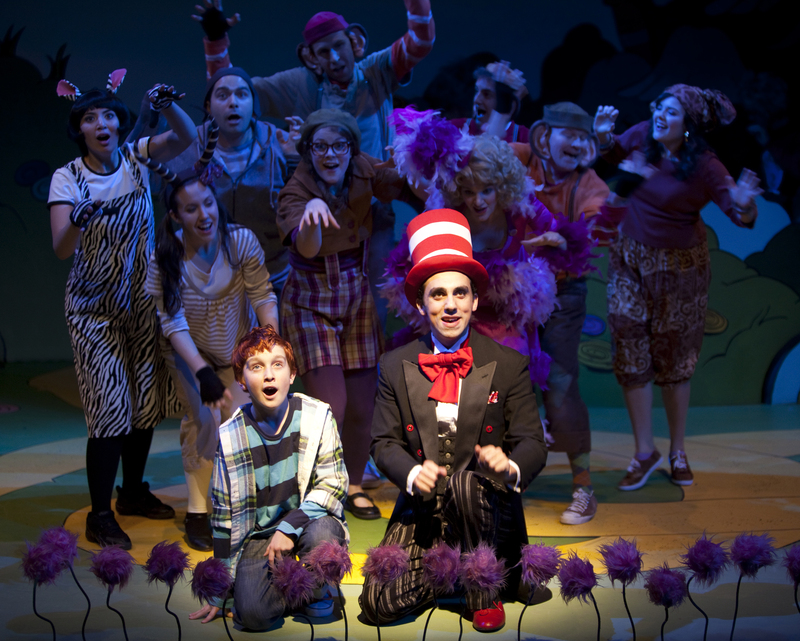 Seussical, the ambitious musical imagining of Dr. Seuss stories, opened on Broadway to great expectations almost exactly a decade ago and all signs pointed to a guaranteed hit. Composer Stephen Flaherty and lyricist Lynn Ahrens were fresh off of the success of their 1998 Tony-Award-winning Ragtime and the Seussian connection promised to deliver a multitude of new young fans to musical theatre. Sadly, the show received a spate of negative reviews and was dead within six months. The cast of Carousel Theatre's Seussical the Musical. Photo by Tim Matheson. The show has since been rewritten and reworked several times over for touring and community productions. Plot lines and characters have been moved, changed or scrapped altogether in some cases. The original runtime of two and a half hours has been halved into a streamlined kid-friendly 75 minutes. Compared to the original glitzy circus-style production, director Carole Higgins’ version of Seussical has been stripped down to the basics. Luckily, all for the better. It’s a testament to the lasting magic of Dr. Seuss’s literary creations that the barebones approach works so well. His oeuvre was always about igniting and inspiring young minds, so it seems only fitting that imagination be an integral part of Seussical. Gone are the high-flying aerobatics and elaborate sets. Barbara Clayden’s costumes stick to a very minimalist approach. The audience is left to imagine everything else. An arm in a grey sleeve effortlessly becomes an elephant’s trunk and the frills of a long pink coat become a bird’s tail-feathers. The Cat in the Hat (Darren Burkett) serves as a narrator/master of ceremonies who pulls Jojo (Taylor Lintott) out of the audience and plops him straight into the thick of the action on stage. A procession of favourite Seuss characters soon follows. Horton the elephant (Josue Laboucane) is a reluctant hero who discovers the existence of an entire miniature world on a speck of dust. Mayzie la Bird (Rebecca Talbot) struggles with the idea of being a single parent and Gertrude McFuzz (Kaylee Harwood) has issues with her body image. Lintott, Burkett, Laboucane, Talbot and Harwood all let loose on stage and their enthusiasm shines through in spades. In a different show, the series of loosely connected stories wouldn’t pass muster as a plot. But sewn together with the Flaherty and Ahrens score, there’s something magical about Seussical the Musical. The kid-dominated audience on opening night was suitably impressed and the parents seemed to have fun too. And just maybe a few new young theatre fans were born. Seussical the Musical, presented by Carousel Theatre, runs until January 1, 2011 at the Waterfront Theatre, 1412 Cartwright St., Granville Island. Tickets are available online.